Beach food needs to be easy to eat and hold together well. Here's a great slice recipe from chef Luke Mangan who says it's just the ticket for a sweet snack on the run. Line the base and sides of a 25cm x 30cm lamington tin with baking paper and grease well. Heat the butter and golden syrup in a large saucepan until melted, then simmer gently until golden brown. 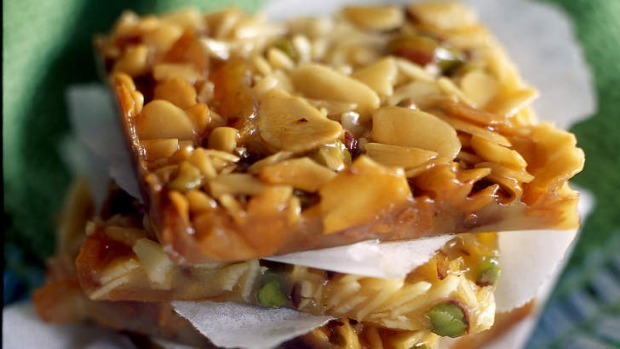 Add the cream, almonds, pistachios and dried apricots and heat through without boiling. Remove from heat and set aside. Place the caster sugar in a large bowl and add the eggs, one at a time, whisking until creamy. Add the sherry and fold through the flour. Gradually add the warm nut mixture, gently folding through until well combined. Spread into the tin and bake for 20 minutes or until golden brown and firm to touch. Cool in the tin, turn out and refrigerate until ready to slice.